Angel Orensanz Wedding Pics always have a certain flare to them. Originally built as a Gothic Revival synagogue, the grand venue is now a historic New York City landmark. The Angel Orensanz Foundation for the Arts was established in 1992, in the Lower East Side of Manhattan, as an artistic and cultural meeting place for artists, writers, thinkers from all walks of life. As a result, the venue has become an exceptional and eclectic space, that gives any Angel Orensanz Wedding Pics something unique and bold. The Angel Orensanz center, named after the Spanish sculptor and painter Angel Orensanz, would make its namesake proud. The space is constantly filled with vibrant sights and joyful sounds, especially when holding wedding ceremony and reception. 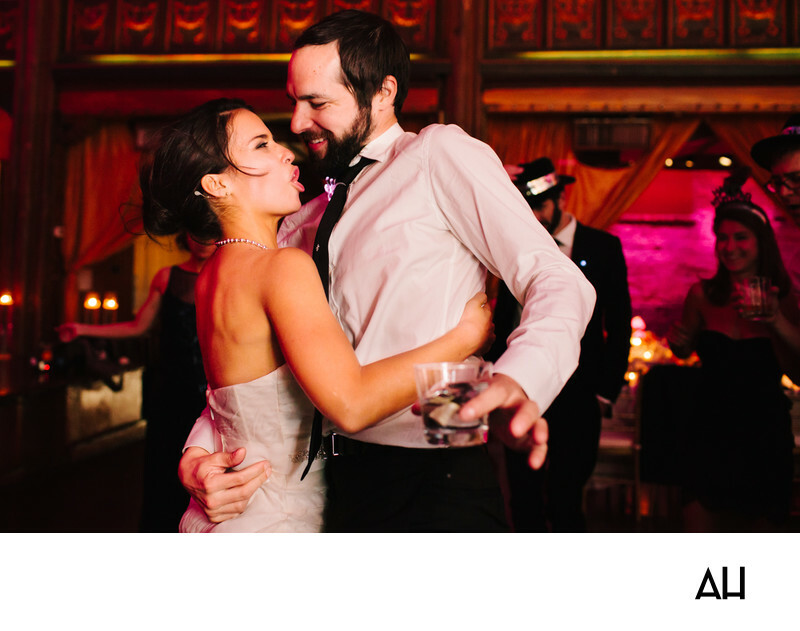 This photograph shows a bride and groom at the venue caught in a moment of uninhibited celebration. Anyone around the couple can see how much the newlyweds enjoy one another’s company and how comfortable they are together. Friends and family dance around the bride and groom, but they don’t seem to notice that anyone else is in the room. They only have eyes for each other. The bride looks up her husband as she belts out the words to the song that is vibrating throughout the room. She holds on tightly to her love, reveling in the energy of this happy moment. The groom gazes down at her in utter adoration with one hand around her waist, the other holding a drink. The pair stand out in their white and black attire against the bold colors that shade the background and guests circle about them as they share this last dance of the evening.